Owl & Weasel #6 from July 1975 will be forever immortalized as the "Dungeons & Dragons" issue. Page 1 of the issue describes the game we all know so well and it is interesting to read something like this; the game as something new and different. The editors admit they are already obsessed with it and there is even a dragon on the masthead, making the issue temporarily Dragon, Owl & Weasel. The article is continued later in the issue. Steve Jackson describes the contents of the box, 3 "little" books and not thousands of pieces. Though he adds that he thinks $10.00 is "too much" to pay for the game. Some things never change really. 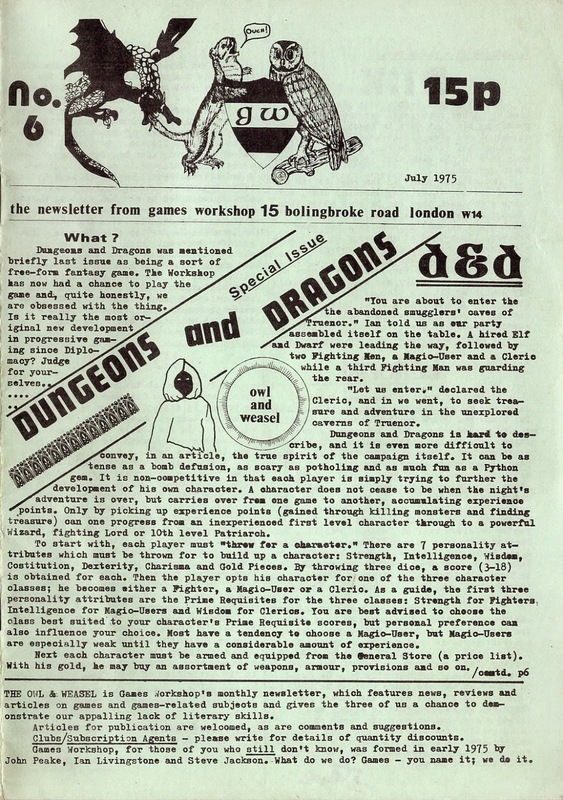 Jackson concludes calling D&D a "modern classic". Moving on in the issue. The Letters page has a letter complaining about the lack women in gaming. Again some things never changing. 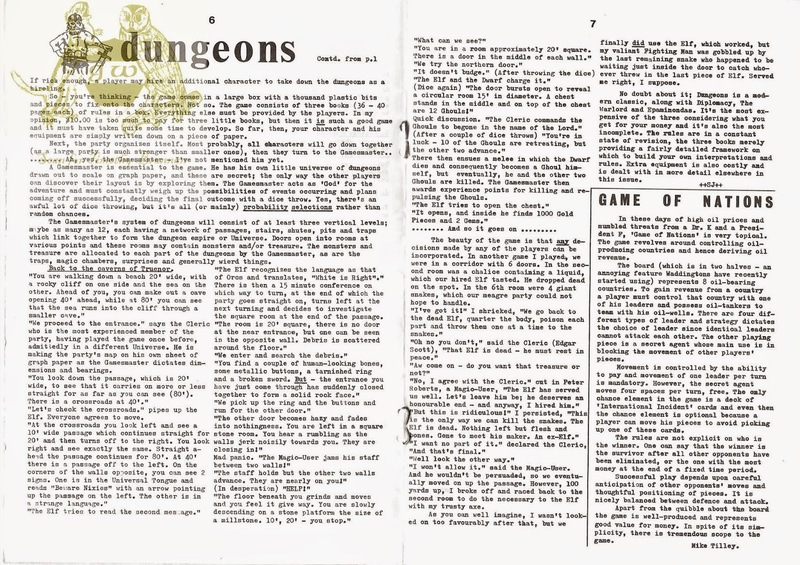 Later on Steve Jackson discusses the costs of D&D. Again the $10.00 price tag is mentioned, but also $5.00 for Chainmail and "at least" $2.50 for dice. Minifigs are also mentioned with several genres mentioned. Additionally Games Workshop reports that they will be selling D&D in at least three weeks. Page 11 is the second part of Percy Kenyon's coverage of Mah Jong. Interesting and more complicated than I realized. I mean I new Mah Jong was a strategy game (and not the solitaire version found on lots of computers) but I guess I didn't think about how detailed it was. The back page features a TSR price listing of what will be soon available in the U.K. The enthusiasm in this article abounds. Sitting here comfortably on the other side of nearly 40 years (and after the largest Gen Con on record) it is easy to forget that once upon a time this hobby of ours was new. Not just new, it had a start and that start is documented here. I am not trying to sound all sappy here. I am big proponent of always looking forward, but sometimes you have to look back to see where you have been. Sometimes it doesn't amount to much, other times the difference is so striking that it leaves you somewhat agape or stunned. This is one of those moments. Sure some of the actual words said are even the same (it costs too much, where are the women?) but these are the first times they have been said and that is something important. Not sure what the next issues will bring, but for me I am looking for that joy of discovery of a new thing. But I guess that is what it is all about all the time really. Cool post. Have not thought about his magazine in years. Where on earth did you find issues? I was given them as a gift for this very purpose!